The Higher Education Policy Institute (HEPI) is publishing a report on the student experience at the University of Oxford and the University of Cambridge. The study shows how this differs from the experience at other Russell Group universities and all UK universities. 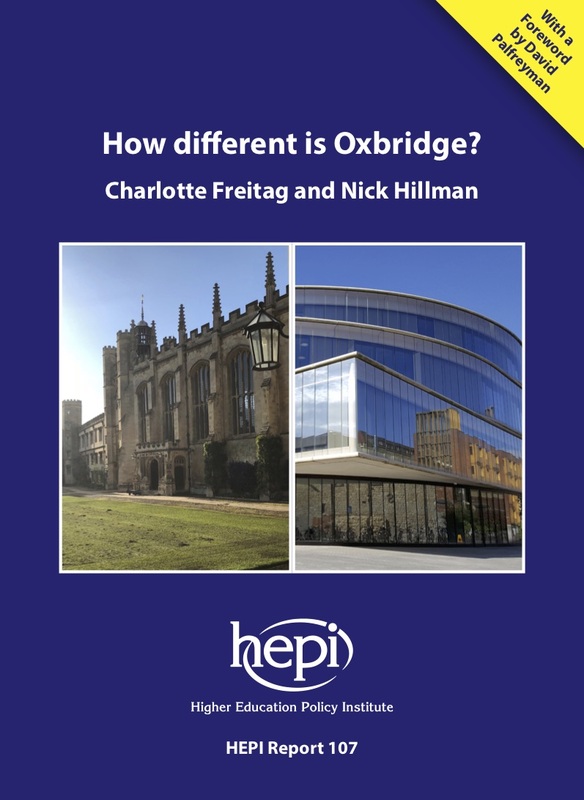 How different is Oxbridge?, by Charlotte Freitag and Nick Hillman, includes a Foreword written by David Palfreyman, Fellow of New College, Oxford, and a member of the Board of the Office for Students. The report is based on data from the annual HEPI / HEA Student Academic Experience Survey collected between 2012 and 2017. The responses of 1,625 Oxbridge students are set against the responses of 18,354 students at other Russell Group universities and then compared to the responses of 60,221 undergraduates across all UK universities. 52% of all UK students say their teachers use original or creative teaching methods ‘a lot’ or ‘quite a bit’, more than at Oxbridge (41%) or other Russell Group institutions (45%). Oxford and Cambridge perform almost unbelievably well. Oxbridge students work harder, are more satisfied with their lives and are more likely to say they are getting good value for money than other students. Our results confirm the two universities provide a world-beating student experience alongside their world-beating research. The data reveal an even more positive story than I expected. But there are good reasons for this. Oxford and Cambridge have a high level of resources, unrivalled facilities, well-prepared students, close-knit collegiate environments and diverse and experienced staff from all over the world. As a country we are fortunate to have two such undeniably excellent institutions. Other countries look at them jealously. But it is crucial that policy makers remember the degree to which Oxbridge is exceptional rather than typical. Anyone who assumes the same policy interventions will work across the board is likely to be disappointed. I was surprised Oxbridge students are happier and more satisfied with their lives than other Russell Group university students while working 12 hours more per week. They tend to work a full 40-hour week during term-time, unlike students studying elsewhere in the UK. On the other hand, I did not expect them to perceive their teaching to be less original than students elsewhere but that is the case. In one important area, class sizes of over 100 other students, it is other traditional universities that are the exception. Such large classes are less common at Oxbridge and universities overall than at Russell Group universities. This valuable assessment of what is different, however, focuses rightly on the perspective of the students attending Oxford and Cambridge, drawing on HEPI’s vast database of survey data and applying its usual statistical sophistication in analysing it. Ironically, the key lesson for policymakers from our research on Oxbridge is: don’t get too obsessed about Oxbridge. Oxford and Cambridge are different from the rest of the university sector. If we are to retain our world-class reputation for higher education, then we need to recognise this and look at the specific challenges faced by other universities too. Our research confirms Oxford and Cambridge are very different and exceptionally good. They are different to other Russell Group institutions as well as all other universities. On issues like student workload, value for money perceptions and course satisfaction, it is hard to distinguish non-Oxbridge Russell Group members from other universities. On larger class sizes, other Russell Group institutions are the outliers, for their students have more large classes than those at Oxbridge or elsewhere. Yet it is too simplistic to blame the other Russell Group institutions for this. As a society, we expect Russell Group members to offer a wide range of courses, some of which are very expensive to provide, and to keep up with the international competition on research. Yet we do not fund either high-cost subjects or research in full. So large class sizes are, in part, a consequence of the wider political environment in which these institutions operate.